A couple of short years ago, the certification process for ATP pilots changed. We are all familiar with the reasons and what the changes were, but we are starting to see data that can help forecast some of the effects. 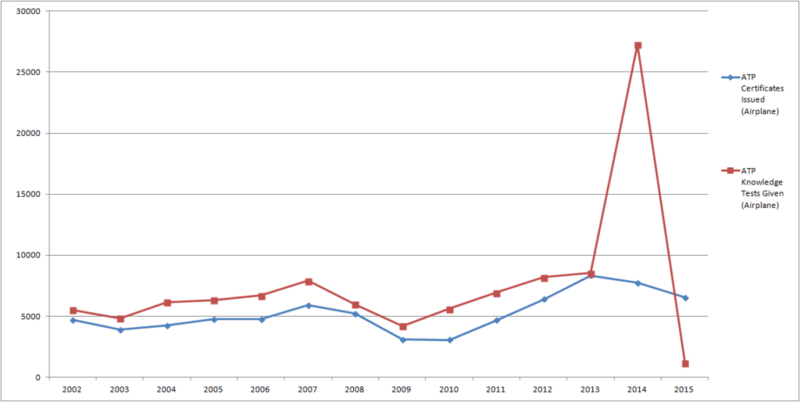 In short, our ATP certification numbers are trending down and we can expect that it is going to continue. If we look at the trends of ATP certificates issued on a yearly basis since 2002, we typically saw stability and correlation between the number of ATP knowledge tests and ATP pilot certificates issued on a yearly basis and in comparison with each test. This made logical sense that we would expect to see those who took ATP knowledge tests continue on to take ATP practical tests (resulting in ATP certificate issuances). In 2014, when changes were made that would require potential ATP pilots to complete an ATP CTP course prior to being eligible to take even the ATP knowledge test, we saw a significant increase in ATP knowledge test administration as pilots took the test in an effort to avoid needing to take the ATP CTP course. After August 1 of 2014, pilots were no longer able to take the ATP knowledge test without taking the ATP CTP course, and we see an unprecedented drop in pilots who took ATP knowledge tests in the statistical data for 2015. We have traditionally seen strong correlation between those who took knowledge tests and those who took practical tests, and after conversations with numerous examiners and providers of ATP training around the country, we can expect to see the same correlation in ATP Certificates issues in 2016 (although we will have to wait for another year to see this data). The pilots who completed taking ATP knowledge tests in 2014 will need to complete their practical test prior to the expiration of their FAA knowledge tests (the ATP knowledge tests they took) on August 1, 2016. After this time, the knowledge test they took would no longer be valid for use in qualification for their ATP practical test. 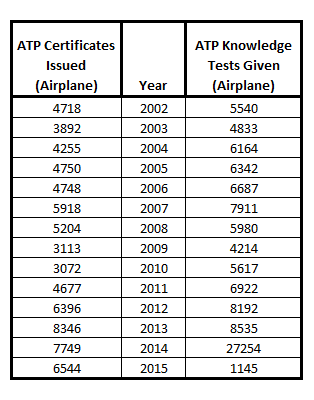 The lead/lag of the knowledge test followed by practical test process indicates that we should expect a large increase in practical tests for certificates issued for ATP pilots prior to August 1, 2016, then it is expected that we will see a significant decrease after the August 1, 2016 date based on the low number of pilots who completed ATP knowledge tests during 2015 and the fact that those who took it earlier will no longer be eligible to take the test. Over the next couple of years, it is highly likely that our industry is going to experience a significant decrease in the total number of ATP pilot certificates issued on a yearly basis compared to historical numbers. This decrease will directly affect the number of available pilots who will be able to be employed in airline pilot positions.